The tourmaline is a semiprecious crystal with a variable chemical structure, a complex silicate of aluminium and boron. One of the ancient meanings of its name is that of “stone that attracts ash”, by ash meaning both harmful radiations and negative energies, toxins. There are 26 microelements of Minendeleev’s Periodic Table in its composition, among which potassium, calcium, magnesium, manganese, iron, silicon, iodine, fluorine, etc. The tourmaline belongs to the minerals with a trigonal system of crystallization. Out of the chemical formula can be seen that the hidroxilic ions (-OH) and the ions of fluorine (-F) can combine with other metals in different ratios, this composition determining the colour and the hardness of the mineral (between 7 and 7.5). Another property of the tourmaline crystals is the piezoelectricity that becomes evident by the electrical polarization of the crystal, as a consequence of a mechanic action (pressure or torsion) applied on a certain axis. Also, most of the tourmaline varieties show the pyroelectricity property that is the appearance of an electric polarization after heating or cooling the crystal. The tourmaline is the first material in which these two properties were put into evidence. Of all the minerals in the world, only the tourmaline carries in it a permanent electric charge, which brought it the name of crystal magnet. 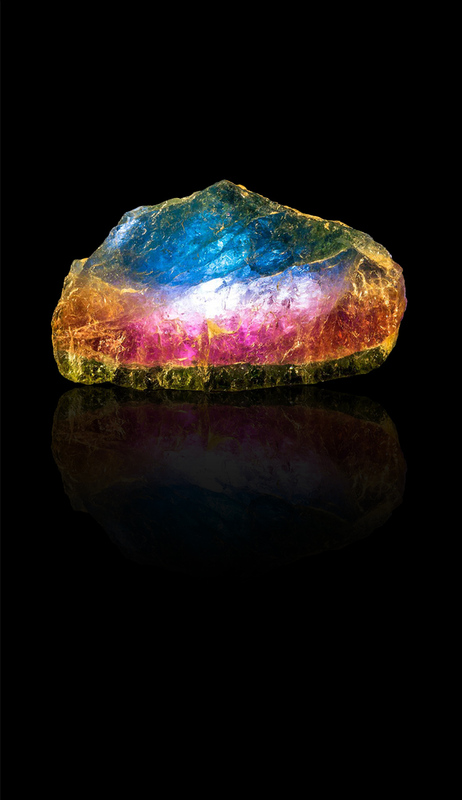 Of all the diversity of the stones, it is considered the absolute champion for the specter of colours and hues. Natural gloss, transparency and hardness conferred this mineral a well deserved fame of precious stone. When heated, the tourmaline creates a low magnetic field, releasing infrared rays and anions (ions charged negatively). This phenomenon has beneficial effect on the human body, known and medically acknowledged: stimulation of the immunity and endocrin system activity, improvement of the fertility and stimulation of the sexual function, improvement of the blood quality and help to clear the toxins from the vessels, improving the peripheric blood circulation. The tourmaline is also used for its powerful antibacterial and detoxifying effect, as it helps eliminate the toxins that trigger unpleasant diseases and odours as well as reduce headaches and diziness.